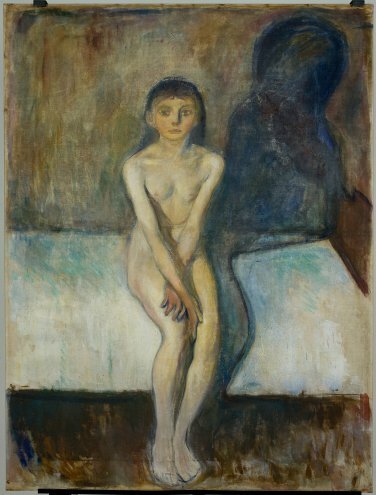 The Munch Museum in Oslo recently opened the Exhibition “Puberty. Summer Exhibition 2012″. As main focal point of this exhibition is Edvard Munch’s Puberty, 1894, a painting that has not been shown to the public for more than ten years. Munch painted several versions of Puberty, though, and the National Museum in Oslo also holds a painted version from the same year which has been available to the public the past years. In addition to this, the Munch Museum holds a Puberty painting from 1914-1916. Edvard Munch’s painting Puberty belongs among the world treasures of modern art. Nevertheless, little investigation into its materials, current condition and treatment history has been made. This actualized the requirement for down-to-earth information about the work as a physical object before carefully considered plans for future treatment and for the prevention of further damage could be drawn up. An extensive investigative and conservation process was therefore initiated. Read more about the conservation of the painting The project was an attempt at a thorough examination and systematic survey of Munch’s main paintings’ “biography”, and particularly its present condition. The work stretched out over a year, and included an analysis of the materials, a study of the problems associated with the painting, as well as finding a responsible method for treating and conserving it for posterity. The examination of Puberty was carried out with support from EU-financed research . A number of specialists both from Norway and abroad have further contributed to this process. Characteristic of Munch’s work of the period is the varied use of techniques, working processes and treatments of the pictorial surface. Many variations may appear in one and the same work. The use of different technical methods in one painting may be noted particularly in Puberty. The painting is marked by experimentation in the use and handling of the materials – the canvas and paints. Here Munch emphasised the material character of the work by creative juxtaposition and effects, such as the treated painted surface and the exposed canvas. The working method enhances the textural quality of Puberty, which is emphasised by locally applied varnish – this makes any type of treatment, such as successful cleaning or consolidation, very challenging. The competent preservation of Puberty was a major aim of the project, and involved study of the original materials and of the treatment history as well as how the latter influenced the current condition of the artwork. The work done on Puberty is relevant for the conservation of the remainder of the paintings in the Munch Museum as well. New information derived from this study benefits the entire collection. A new catalogue has been published with articles written by Jay A. Clarke, Finn Skårderud, Biljana Topalova-Casadiego and Ingebjørg Ydstie.